The legend has that Goddess Sri Satyabhama revealed her desire to have Parijatha flowers to Lord Krishna. Lord went in search of Parijatha flowers to please his consort Goddess Sri Satyabhama. He continued search for the flowers for long and his task turned out unfruitful. He meditated upon Lord Shiva and with the help of Lord Shiva located a land full of Parijatha flowers in abundance. Consequently, Lord Krishna with his consorts Goddess Satyabhama and Sri Rukhmani arrived on this sacred land and resided here at their own will. This is one of the holiest places equivalent to Dwaraka. Vishwaksenar the chief of the Nithyasuri was the son of Kundalai and Lord Varuna (Rain god). Kundalai was sent to disturb the penance of Saint Dhuruvasa by Lord Indra and gained his curse. So, she was born as a hunter's daughter and married Pathiran a hunter. One day Lord Varuna loved her and as a result she bore Vishwaksenar as her child. Later by his hard penance he was made the chief of Nithyasuri's the good spirit's who live in Pramapatha and who are always near Lord Narayana. He wished to have darshan of Lord Narayana as Lord Krishna and fulfilled his wish here. Rudran was caught by Brahma Hathi dhosham, an evil spell as he killed Lord Brahma. To over come this he prayed the Lord at Kadamba kshetram, Kantiyur and here at this place got rid of his problem. Kavalam in Tamil means a place of dense flower garden. The Lord at this place gave his blessings to Senai Thalaivar and Rudran after he got rid of his Sabham. Here the Lord accepts the pure state of his devotees as food and so this place is called Kavalampadi. Being one of the 108 Divya Desas, during the Tamil month Thai, January-February, next to the new moon day, the deities of 11 temples assemble here for Garuda Seva according to tradition. 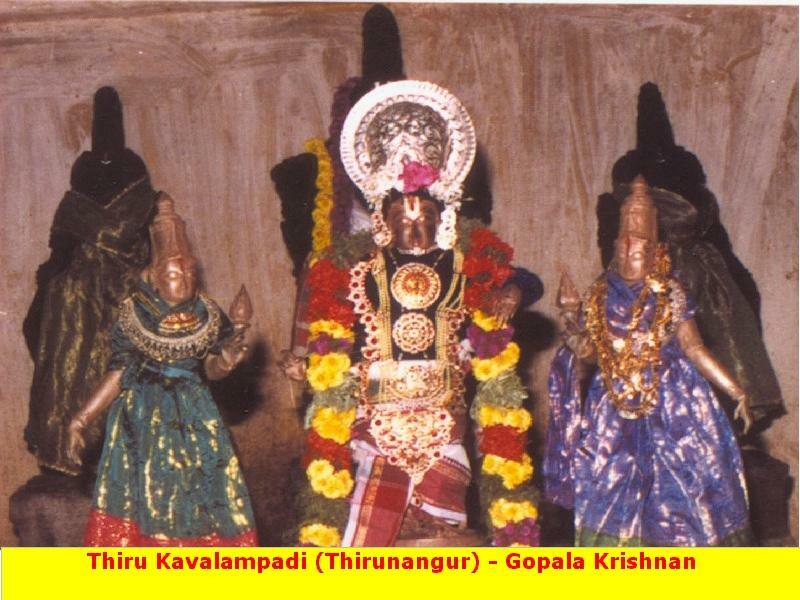 Thirumangai Azhwar visits the place to offer his Mangalasasanam to all the Perumals-deities. When the paddy crop waves by the wind, the devotees here consider it that Thirumangai Azhwar has come to the place. 07:00 am to 11:00 am ; 05:00 pm to 08:00 pm. Sirkazhi to Poompuhar Bus Route. Get down at Thirunangur.